Wow what a fun couple of days! Friday morning was what I like to call "spa day"! 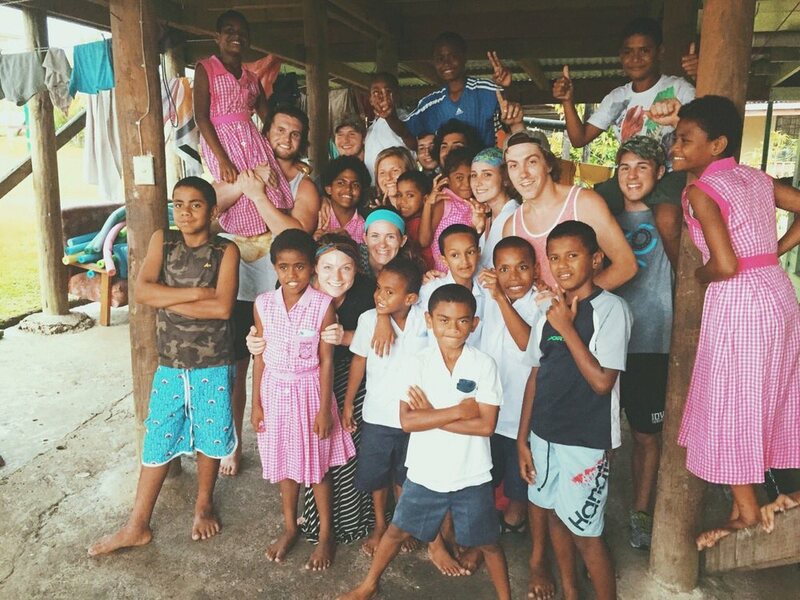 We woke up, did our normal morning routine, and then headed to the Sabeto Mud Pools! I'm sure you saw a picture from that day, but if not, here is what we did. We all go into this natural hot spring and cover ourselves from head to toe in mud. Not the gross kind of mud, but some type of mud that is supposed to be AWESOME for your skin. (Who knows if it is legit but I totally believed them- despite the smell). After you are covered, you go stand in the sun and let it dry, kind of like doing a clay mask. Then you go back into the spring and wash it all off. Then spring number 2- it is very warm and very relaxing. You chill there for a bit and then go off to pool number 3- which is cool and refreshing. It was such a fun Fijian "spa" experience! Afterwards, you guessed it, we hit the beach! I think I might have been the only one on the beach though :). Everyone was so excited to talk to you all, so a lot of them went and got wifi at different cafes! That afternoon we went to the Loloama house and did another kids club and continued our tutoring with the kids! That night we got to hear from our AMAZING chefs- Uncle Tomasi and Auntie Serena. They are actually Talei's parents, which has been so fun. They are such a blessing to us and such an encouragement! Saturday was another fun day. We did our normal morning routine, and then went to do the "Sleeping Giant" zip line and waterfall hike. It was a series of 5 different zip lines, weaving through the mountain, it was AWESOME. Don't worry, I was the first one to go, made sure it was safe for everyone. I also screamed the loudest and I was the example of "how not to break" :) that afternoon we hit the beach! Everyone's favorite thing to do. We had a great dinner, packed for Suva, and went to bed, ready for the morning! Sunday we departed for Suva city- the capital of Fiji. It was a good 4 hour bus ride- but we made lots of fun stops on the way. One being a little pier we stopped at called Maui Bay Jetty. It was BEAUTIFUL, crystal clear water and little fishes everywhere. We had a picnic there and some people stopped to swim! We got a bunch of great pictures. We then continued on our journey to Suva! Once we arrived, we went to Homes of Hope, the place we will be staying for the next couple of days. Homes of Hope is a rehabilitation center for abused women, it is an absolutely beautiful campus tucked away in the jungle. We all got settled in, and then went to the Suva mall to grab some food at the food court! Monday morning (this morning) we all had breakfast in the little kitchen we have, cooked some eggs and made some coffee, accompanied with a devo by Miss. CheyAnn. Every day a student has been leading a devotional, and it has been so cool to see the students lead and share what the Lord has been teaching them. We then headed off the Fiji Museum and learned all about the history of Fiji and the Fijian culture. Cannablism used to be a thing here- but don't you worry- it is no longer! :) Later this afternoon we will did a kids club at a school for the deaf, which everyone LOVED. It was so cool to see that you don't need to know their language to show them God's love. Everyone agrees that the deaf school was their favorite thus far. The kids had so much joy and it was so encouraging to us. That night we had the opportunity to hear from the Pittmans, which was neat. They shared how Island Encounters came to be, how they met, why the do what they do, and what the pray we take away from this month. Ray has some crazy stories!! Everyone is doing well and everyone has great attitudes and high spirits! We all miss you very very much and we are so appreciative of your prayers! I would ask that you all continue to pray for safety, especially traveling to Australia, and for all of us to have servant and willing hearts! !